BBC RADIO 1 LIVE LOUNGE STYLE! 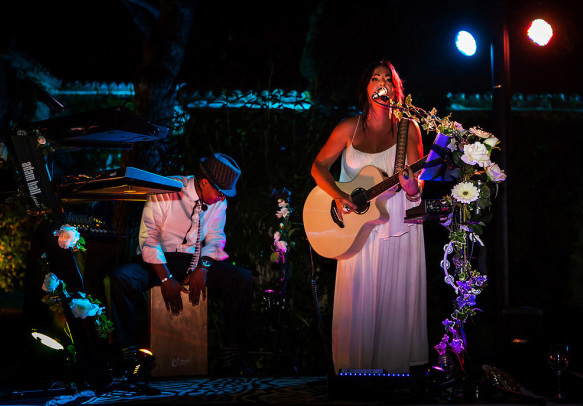 Formerly known as the "Maia Project", the "Sarah Howard Duo" began in 2009, when band-mates Sarah Howard & Dagmar Fuentevilla, decided to have a break from their 6 piece funky band "AticoFunk", and form an acoustic duo, after they performed a Michael Jackson Tribute concert together. Based in the Andalucia region of Spain, Sarah Howard is already an established solo artist, and Dagmar is a full time "Latin Salsa" musician, as well as heading a 6 piece funky band...so this collaboration had the potential to be the start of something interesting!! Taking their influences from British and American popular music, they began to choose songs they wanted to cover, and later hoping to bring in some "original" music of their own. Both liking funky and soulful influenced music, they soon formed a strong union, through a love of similar music, together with mutual admiration for each others' musical ability. Their repertoire soon grew, and they found their style was a mix of Jamiroquai meets Sheryl Crow, Marvin Gaye meets Sam Sparro..... as well as the BBC Radio 1 Live Lounge sessions, where popular songs are reworked in unique and original ways, which is a fundamental ingredient in the "Sarah Howard Duo"...to create something innovative and new, from a song that everybody knows! Sarah has a very strong and versatile singing voice, which never fails to impress audiences, together with her feisty rhythm guitar, shows she is an accomplished musician, and not just a "chick singer"! Sarah plays acoustic guitar, and a "stompbox" drum pedal & she sometimes plays electric guitar for a more funky sound! Her trade-mark "TC Helicon" harmoniser pedal is her favourite stage toy, which, along with many guitar and vocal effects, where she can achieve 2 or 3 part vocal harmonies at the press of a button, to enrich her vocal performance...which leaves audiences searching round the room for the other backing singers!!!! Dagmar plays 2 keyboards, (a Korg M-50 synthesiser, and a Yamaha electric piano) where he uses piano sounds, strings, synth, bass lines and much more, which make a very full sound for only 2 musicians...almost like a small band!! He also plays live percussion, with a Cajon drum & bongos. He has recently added an electronic drum pad to his set & has also added some "custom backing", to help support the more up-tempo songs, as well as allow us to play multiple instruments by pre-recording ourselves!! The duo began to record a demo CD at home, and the gigs soon came in, from all over the Costa del Sol; Marbella, Tarifa, Gibraltar, La Linea, Algeciras, Estepona, Nerja, Velez & Mijas (see client list), in Bars, Clubs, Restaurants & Beach Clubs, as well as for private events! After 12 months of working together, the duo decided they were ready to expand the project, which they had always intended on doing, as they knew many talented musicians that they wished to work with in various combinations within the group. The 1st "Project" collaboration was with Cuban Saxophonist TIRSO ROCHE, who they had played with before for many years, adding funky/ jazzy sax and flute! A 2nd collaboration came with their old band mate JESUS MONTES, from San Roque, Spain, who played percussion with Maia Project in the early days, (congas, wind chimes and other percussion instruments). Jesus also played many gigs with Sarah in Gibraltar, during 2010, as an alternative Maia Project duo! They still occasionally play with Jesus, for a more "acoustic trio" vibe! The 3rd musician to collaborate with them was Spanish drummer GUSTAVO GOTTARDI They played many gigs during 2011 & 2012 with Gustavo as a trio** with drums and percussion, which added another dimension to the group...as well as a much louder and more upbeat experience! !THE TRIO IS NOT CURRENTLY WORKING TOGETHER!! The act is only available as a DUO. 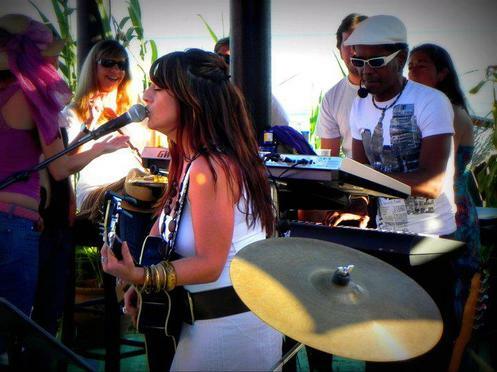 The Sarah Howard Duo have started to get quite a following of fans in the Marbella area, due to their innovative style, great selection of songs, their skills as LIVE musicians....and of course Sarah's impressive voice, as well as their original choice of song material, different to many other acts in the area!! **The TRIO is not currently available for live gigs. As well as being a popular band in bars, nightclubs & beach bars, the "Sarah Howard Duo" also began to play a number of weddings, through direct and agency bookings. They found that the younger, more "chic" wedding clients were looking for something a bit more contemporary than regular "4 piece wedding bands" each playing the same list of "wedding band" songs!! Clients were blown away to put it lightly, as they did not expect such a high quality act at a wedding, again with raving feedback from guests who were pleasantly surprised! (see references and feedback page). This year they are off to Barcelona and Tuscany in Italy to perform VIP weddings! The "Sarah Howard Duo" is currently playing in the Costa del Sol area, with both musicians playing solo or other band projects too..making them one of the hardest working bands (individually, or as a unit) in this area. The future sees more songs, more "toys" and music equipment/ instruments being added, possibly new collaborations....and hopefully a little more diversity and experimentation over the coming months...as well as more recordings and videos......so keep an eye on the ever changing "Sarah Howard Duo" !